An expanding reference or range is essentially a dynamic reference which can expand as a formula is copied down or across cells. 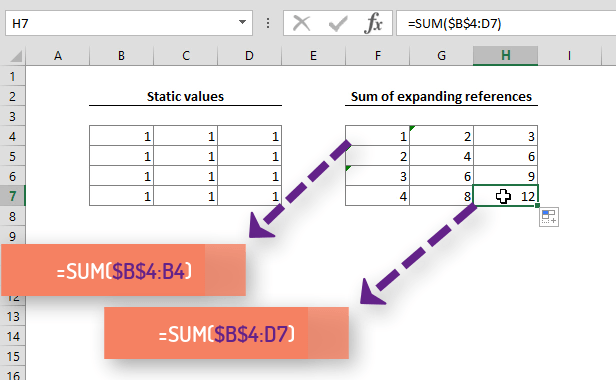 In this article, we’re going to show you the expanding references in Excel and go over some common use cases. To create an expanding range, you need to use an absolute and a relative reference. The absolute reference works as an anchor while the relative cell is going to be updated as you copy the formula. While the absolute B4 reference remains unchanged, the relative B4 reference becomes D7 after 3 rows and 2 columns. This is how you can establish an expanding range.